As we saw in Section 8.5, when a high Reynolds number fluid passes around a streamlined obstacle, such as a slender plate that is aligned with the flow, a relatively thin boundary layer form on the obstacle's surface. Here, by relatively thin, we mean that the typical transverse (to the flow) thickness of the layer is , where is the length of the obstacle (in the direction of the flow), and the Reynolds number of the external flow. 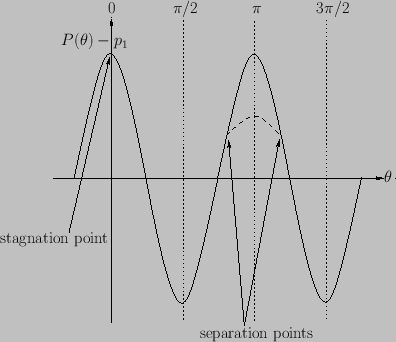 Suppose, however, that the obstacle is not streamlined: that is, the surface of the obstacle is not closely aligned with the streamlines of the unperturbed flow pattern. In this case, the typically observed behavior is illustrated in Figure 8.11, which shows the flow pattern of a high Reynolds number irrotational fluid around a cylindrical obstacle (whose axis is normal to the direction of the unperturbed flow). It can be seen that a stagnation point, at which the flow velocity is locally zero, forms in front of the obstacle. Moreover, a thin boundary layer covers the front side of the obstacle. The thickness of this layer is smallest at the stagnation point, and increases towards the back side of the obstacle. 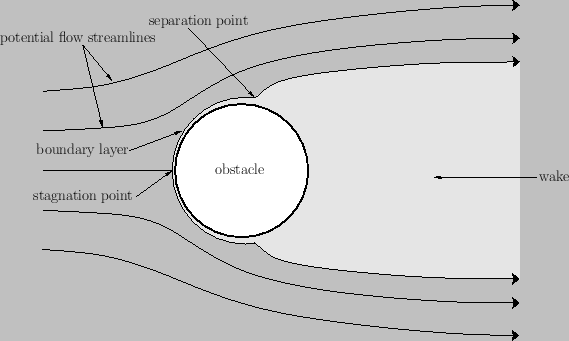 However, at some point on the back side, the boundary layer separates from the obstacle's surface to form a vortex-filled wake whose transverse dimensions are similar to those of the obstacle itself. This phenomenon is known as boundary layer separation. Figure 8.11: Boundary layer separation. where is a constant. The tangential pressure gradient is such as to accelerate the tangential flow on the front side of the obstacle--this is known as a favorable pressure gradient. On the other hand, the pressure gradient is such as to decelerate the flow on the back side--this is known as an adverse pressure gradient. Boundary layer separation is always observed to take place at a point on the surface of an obstacle where the pressure gradient is adverse. where is the fluid density, and the typical transverse size of the obstacle (in the present example, the radius of the cylinder). The drag force that acts on a non-streamlined obstacle placed in a high Reynolds number flow, as a consequence of boundary layer separation, is generally characterized by a drag coefficient of order unity. The exact value of the coefficient depends strongly on the shape of the obstacle, but only relatively weakly on the Reynolds number of the flow. Consequently, this type of drag is termed form drag, because it depends primarily on the external shape, or form, of the obstacle. Form drag scales roughly as the cross-sectional area (per unit width) of the vortex-filled wake that forms behind the obstacle. Figure 8.12: Pressure variation over surface of a cylindrical obstacle in a high Reynolds number flow both with (dashed curve) and without (solid curve) boundary layer separation. Boundary layer separation is associated with strong adverse pressure gradients, or, equivalently, strong flow deceleration, on the back side of an obstacle placed in a high Reynolds number flow. Such gradients can be significantly reduced by streamlining the obstacle: that is, by closely aligning its back surface with the unperturbed streamlines of the external flow. Indeed, boundary layer separation can be delayed, or even completely prevented, on the surface of a sufficiently streamlined obstacle, thereby significantly decreasing, or even eliminating, the associated form drag (essentially, by reducing the cross-sectional area of the wake). However, even in the limit that the form drag is reduced to a negligible level, there is still a residual drag acting on the obstacle due to boundary layer viscosity. This type of drag is called friction drag. As is clear from a comparison of Equations (8.79) and (8.120), the drag coefficient associated with friction drag is , where is the Reynolds number of the flow. Friction drag thus tends to zero as the Reynolds number tends to infinity. The phenomenon of boundary layer separation allows us to resolve d'Alembert's paradox. Recall, from Section 5.8, that an idealized fluid that is modeled as inviscid and irrotational is incapable of exerting a drag force on a stationary obstacle, despite the fact that very high Reynolds number, ostensibly irrotational, fluids are observed to exert significant drag forces on stationary obstacles. The resolution of the paradox lies in the realization that, in such fluids, viscosity can only be neglected (and the flow is consequently only irrotational) in the absence of boundary layer separation. In this case, the region of the fluid in which viscosity plays a significant role is localized to a thin boundary layer on the surface of the obstacle, and the resultant friction drag scales as , and, therefore, disappears in the inviscid limit (essentially, because the boundary layer shrinks to zero thickness in this limit). On the other hand, if the boundary layer separates then viscosity is important both in a thin boundary layer on the front of the obstacle, and in a wide, low-pressure, vortex-filled, wake that forms behind the obstacle. Moreover, the wake does not disappear in the inviscid limit. The presence of significant fluid vorticity within the wake invalidates irrotational fluid dynamics. Consequently, the pressure on the back side of the obstacle is significantly smaller than that predicted by irrotational fluid dynamics. Hence, the resultant pressure force on the front side is larger than that on the back side, and a significant drag is exerted on the obstacle. The drag coefficient associated with this type of drag is generally of order unity, and does not tend to zero as the Reynolds number tends to infinity.